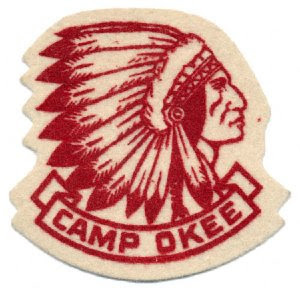 Back in March Larry Johnson kindly took time to review the items in his collection related to Camp Okee and Camp Siouan, compare them to the listings on my web site, and send me pictures of items I was missing, including items like a Camp Okee belt buckle and mug. Look for these and related items on the Peninsula Council Camp emblems page. 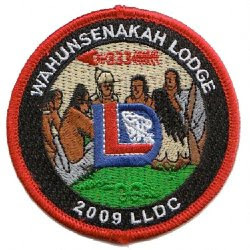 George Homewood, Lodge Advisor for Wahunsenakah, shared this patch issued at the recent Lodge Leadership Development Conference. The 2009 LLDC for Lodge 333 was held June 5-6 at the Indiantown Hunt Club, near Capron, VA. 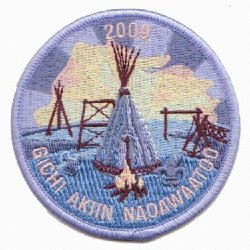 The patch design features a council of native Americans with the National OA logo for LLDC superimposed. 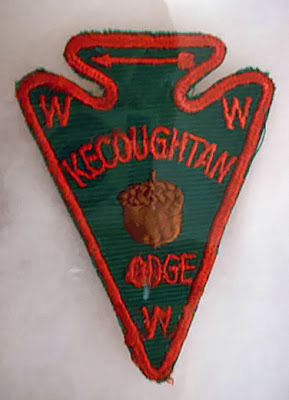 Former Chanco Lodge Chief Ben Vincent supplied me with an excellent picture of Lodge 483's first activity patch, issued for the 1957 Jamestown Pilgrimage. I didn't have this emblem listed on the 483 Activity Emblems page since I used an early edition of the Blue Book as my original reference and it is not listed there (it is included in Blue Book VI). Ben spotted the omission and kindly notified me and sent along the needed picture of the patch. 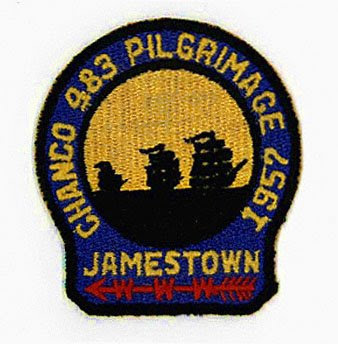 In the History of Chanco Lodge 483 WWW, published in 1972, Jack Oliver, who assembled the first Chanco Lodge patch collection for display, describes this patch as "representing Chanco Lodge's trip to Jamestown to put on the Chanco Story," a pageant performed by the Lodge that told the story of how the young Indian brave Chanco saved the Jamestown colonists from a surprise attack in 1622. 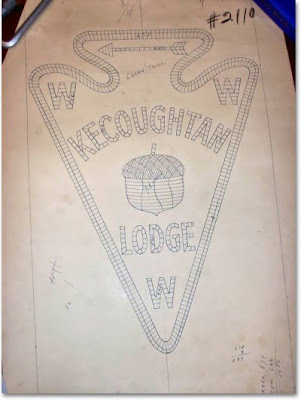 The entire script of the pageant is included in the History of Chanco Lodge 483 WWW document. Another memorable event was the performance by the Chanco Lodge dance team at the 1957 Jamestown Festival held at the Jamestown Island Historical Area. 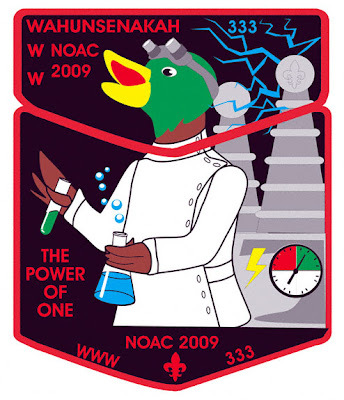 A commemorative patch was issued in honor of this event. 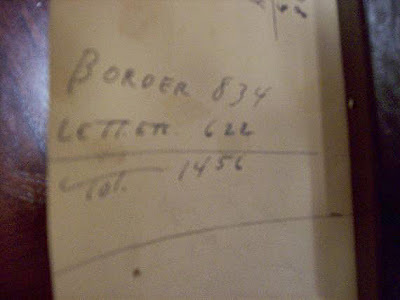 At later lodge functions, home movies of this performance have been replayed." Chanco Lodge was invited by the APVA (Association for the Preservation of Virginia Antiquities, I think!) to participate in the 1957 Jamestown Festival. This event was commemorating the 350th Anniversary of the founding of Jamestown in 1607. The play, “Chanco, the Real American” by Herbert Cobb was presented. If you will look more closely at the script of the play in the earlier “History of Chanco Lodge,”,you will see various places where it calls for the dancers to perform. I loosely used the term dance team performance for what was indeed a far bigger undertaking. There were several dance team performances, all part of the larger pageant. We used to show old home movies of this performance at later fellowships/ordeals, etc. We always referred to them as the dance team performing at Jamestown. I did mention the pageant in the Chronicles. 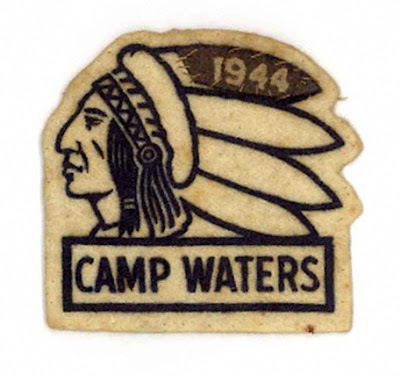 It is found on Page 5 in the section on Camp Waters. This play was put on there for several years. It was also performed on a few other occasions at schools and at Scout Expos. Please note that the pilgrimages to the Chanco Lodge Memorial located in the Surry County Courthouse Square, are different events than the Pilgrimage to Jamestown in 1957." 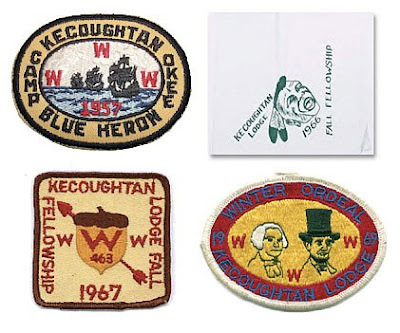 In the list of Chanco emblems that DeWitt Holland sent to me entitled Chanco Lodge Issues 1952-1995 there are two versions listed of this patch, with the difference described as "2 Varietys, Leader's or Boy's, Yellow or Blue behind arrow." I am trying to locate a photo of the leader version for inclusion on this web site - let me know if you have one to share!